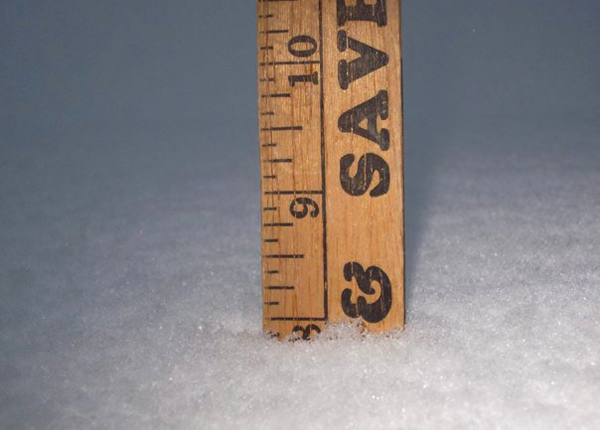 According to weather officials, January’s snow storm dumped 8.4 inches on Chattanooga, making it the 6th deepest snow in recorded local history. That’s the largest snowfall seen in this area since the infamous Blizzard of ’93, and the longest lasting snow cover this area’s ever seen. The storm’s depth and longevity will likely make it the new standard for comparison and hopefully reduce the number of people who suffer a flashback to that iconic storm 18 years ago every time the region gets even a dusting of snow. Since Northwest Georgia doesn’t get a lot of snow, and usually not that much when it does snow, most of us aren’t as prepared for winter weather as we should be. Last year’s biggest snowfall only lasted a few days and melted away quickly, providing little opportunity to practice coping with and removing the snow. January’s snow lingered long enough to test our “snow skills” and identify strengths and weaknesses that can come into play during the next storm – which might happen within a few days or could be a year or more away. Walker County Schools preemptively cancelled classes for Monday the 10th and Tuesday the 11th based on a predicted 3 to 6 inches of snow. That decision proved to be the right one as snowfall exceeded forecast amounts, and by that Monday morning it was obvious even a two day closure wouldn’t be sufficient. With temperatures not expected to go above 34 degrees for the next five days, on Monday afternoon January 10th The Underground predicted school would be cancelled the rest of the week, a prediction that eventually proved accurate. Once closures were decided school administrators did an excellent job keeping everyone informed and for once SchoolCast worked flawlessly. We were prepared to give Walker County schools an “A” grade for their handling of the snow, until January 28th when a slight bit of ice on Lookout Mountain led to another closure – the eighth so far this school year. Making a decision to close school is difficult (you can never please everyone no matter what decision is made) and we’re certainly supportive of closing school if traveling on the mountain would be dangerous. However, that said, closing down every Walker County school for ice on a day when 90% of students were enjoying spring-like weather doesn’t make any sense. Dividing the county into two groups, one for each high school, would allow for more flexible scheduling with regard to icy weather. Students from the northern schools could stay in their icy snowbound homes while students of southern schools stayed on schedule instead of having to skip summer vacation as punishment for the real estate choices of their northern neighbors. If the system operated that way at least one (or both) of the December snow days would have been school days for students in southern Walker, and the cancellation on January 28th wouldn’t have impacted all of the county’s schools either. That might not be necessary; on January 25th school spokeswoman Elaine Womack said the system is “still within the instructional minutes” and only teachers would have to make up skipped days – assuming there are no more cancellations. But Womack changed her story three days later, saying students would actually be asked to make up two of the missed days. According to WQCH, Womack said kids will lose two scheduled holidays “out of an abundance of concern for students preparing for state exams in the spring.” In other words, providing two extra days to study for the CRCT test that determines how well schools do with state and federal funding. The two holidays being skipped are February 21st – President’s Day – and March 11th, a scheduled teacher service day. School employees will still have to make up more of the cancelled days after school lets out for the year. Within moments of the snow forecast, locals began to panic and ran out to buy milk and bread. That’s the thing to do in a snow, even though nobody really knows why – bread and milk are fine, but no more important during a snow than soup, coffee, or diapers. Because of the demand spike (and near panic in the stores) milk and bread DID briefly run out during the week, with shortages moving from store to store as suppliers were able to make deliveries. Meat and eggs also went dry in several stores, and Walmart at one point sold out of bananas and potatoes. Sleds and space heaters didn’t fare much better. 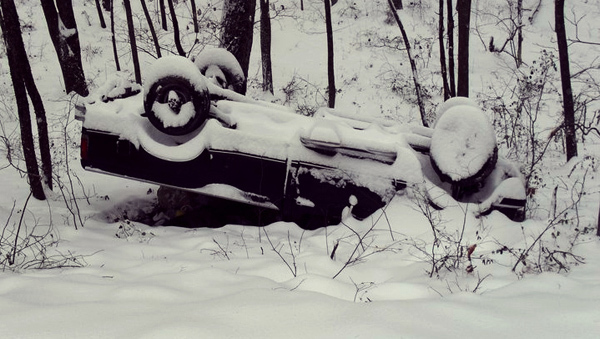 Several stores had supply chain problems due to icy roads around Atlanta, however most of the supply problems weren’t because of delivery issues. Grocery stores maintain regular inventory levels, enough product to meet normal demand between shipments – but when demand spikes up in a situation of panic those inventory levels aren’t sufficient. The whole thing becomes a self-fulfilling prophecy: predictions of a shortage cause people to buy more than usual, and that increased demand results in a product shortage. Perishable items like produce and milk are usually delivered multiple times a week in order to keep inventory fresh, and as a result stores maintain less of those items on hand than they would of a dry item like, say, noodles or light bulbs. 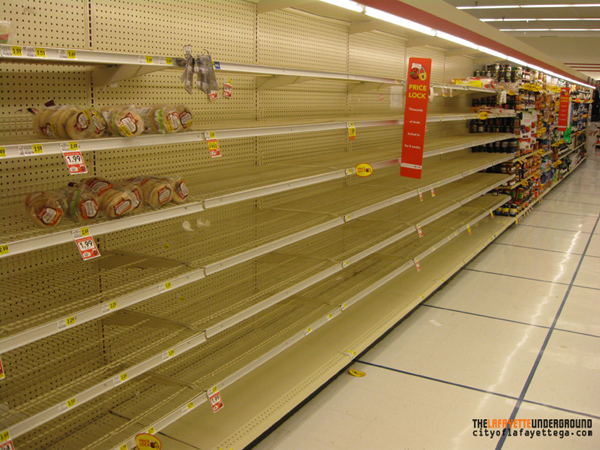 Bread is especially susceptible to shortage since it’s usually delivered every day and stores only have enough on the shelves to meet a single day’s demand. But really ANY product could have this problem – if we all expected stores to run out of toothpaste or donuts they would eventually run out of them due to people rushing in to pick up extras before a storm. The best way to prepare for storm-related food shortages is to not buy up all the food before a storm in a mad panic. Panic is easily avoided by keeping a loaf of bread or an extra package of steaks in the freezer and not letting crucial supplies like propane get too low even in a normal situation. The last thing we need is another store cleaned out of bread and eggs or a fifteen-guy-long line waiting at the Ace Hardware propane tanks. If we learn nothing else from this year’s snow, lets learn to stay prepared for a minor emergency with some backup supplies on hand at all times. January 10th’s weather shut down most of the county’s businesses, but a few did keep their doors open thanks to brave employees who managed to get in to work. Walmart, at least one Dollar General, Bi-Lo, McDonalds, Taco Bell, and No. 1 Chinese all were open in LaFayette the day of the storm, although most closed early due to lack of business. Employees of LaFayette’s two hardware stores, Hammond Jones and Ace, also came in early that Monday and did a good job keeping everyone supplied with shovels, sand, and heaters. While employees managed to come in, many of the businesses themselves were woefully unprepared for the storm. No store or restaurant can be blamed for employees who can’t get to work, but they can be held responsible for not having a plan for how to deal with snow when employees do arrive. Some business didn’t even have a shovel available for clearing snow, discouraging the few customers they might have had from coming in. Roper had full shifts on Wednesday but hadn’t cleared its parking lot yet and at least one employee was injured in a fall coming in to work. Most of the snow fell Sunday night and early Monday morning, but we didn’t observe many businesses’ parking lots or walkways being cleared until Tuesday. Having someone with a bobcat or backhoe prepared to come in early Monday and keeping a shovel and a few bags of sand, salt, or cat litter on hand would have saved a lot of trouble for many businesses that lost money during the whiteout. With many businesses closed and the open ones not maintaining normal operating hours, most people who could get out decided to just stay home. We made several attempts through Facebook to keep folks informed about places open to eat and shop, but it was a daunting task and the information changed rapidly. Having a central Web site or listing of closed (or open) businesses in the city and county would be helpful during future weather events or even an outright disaster – this is something the Walker County Chamber of Commerce, LaFayette Downtown Development Authority, or individual government entities should consider doing in the future for citizen convenience and to minimize the disruption of business (and resultant flow of tax dollars). Walker County Sheriff’s deputies were in abundance during the storm, patrolling in their brown SUV’s and generally maintaining order. LaFayette PD officers were less visible, but still out and about during the storm. Law enforcement authorities said crime reports dropped off to almost nothing during the first few days of snow as most criminals were stuck inside with everyone else and folks kept domestic violence to a minimum. Georgia State Patrol officers weren’t visible at all during the storm, and one source told us there were only three GSP deputies spread across Walker, Whitfield, and Murray counties during the peak of the storm. Reasons for that aren’t clear, but we suspect it’s because GSP was ordered to ferry state legislators to and from the capitol building in Atlanta so they could comply with the state constitution’s requirement that they meet on the second Monday of January. That’s small comfort to people who were involved in traffic accidents on state roads during the same time. Filling the gaps between official law enforcement agencies, good samaritans all over the county dug, pushed, and pulled stuck vehicles out of the snow. Many stranded motorists saved a lot of tow truck fees thanks to helpful neighbors willing to contribute their four wheel drive trucks and elbow grease to keep traffic moving. Those unnamed and unpaid folks serve as the real heroes of January’s major snow. Utility crews working for LaFayette Electric Department in town and for North Georgia EMC in the county both did well restoring service to their few customers who lost electricity during the snow week. Only two power outages were reported within the city, probably related to cars hitting poles, and both were resolved in less than two hours. The utilities’ real accomplishment wasn’t their speed in restoring power but their success in preventing outages to begin with. Both LaFayette Electric Department and NGEMC have apparently learned from previous years’ storms and have been staying on top of maintenance and (especially) tree trimming over the last few years. Maintenance and prevention are more important than response in an emergency situation because done properly those will keep power outages from happening in the first place. That’s the old promise of the postal service (it’s actually not, but most assume it is), and local mail carriers came as close to keeping that vow as they could under the circumstances. Despite obvious logistical problems, mail carriers were spotted out in jeeps and 4×4’s on January 10th delivering to mostly inaccessible mailboxes on barely-cleared roads in the country and driving mail trucks with tiny tire chains within the city limits. The post office gets a bad rap, and we still don’t appreciate their inconvenient operating hours, but USPS in LaFayette was well prepared for the winter weather and went above and beyond what anyone expected them to do. LaFayette’s Solid Waste department, on the other hand, failed to provide basic service during the storm and refused to collect garbage even after most roads had been cleared. The city wasn’t able or expected to pick up trash on the Monday and Tuesday after snowfall but by the skipped Thursday/Friday trash cycle at least 95% of city garbage customers were being reached by mail trucks and could have been reached by LaFayette garbage trucks as well. The city failed to communicate with customers about its plans to skip Thursday/Friday pickup, and people in town wouldn’t have known what to expect in regards to trash without an inquiry from the Walker County Messenger. The Messenger article quoted city officials saying they were “unsure as to when the garbage trucks will begin to run and have no imme-diate plans to do so within the next few days” – small comfort to paying garbage customers drowning under a normal week’s worth of trash plus extra garbage generated by being stuck home in the snow. Residents were advised to “put [trash] out around the can” so extra workers could pick it up “as soon as we get to run the trucks” which would be fine except for the likelihood of dogs or wild animals tearing into the bags and scattering trash all over – which happened at more than one home. All that wouldn’t be as terrible if the city hadn’t already skipped garbage pickup multiple times during the previous month. In December trash wasn’t collected on the Thursdays and Fridays before Christmas and New Years, and wasn’t collected on a Monday or Tuesday after a mid-December snow. And when the trash was collected in December many residents found their cans left half-full after one of the garbage trucks broke down, forcing garbage men to pull bags out of the bins by hand and load it in small pickup trucks. Of course there are going to be times when the trucks can’t run because of bad weather, and even the garbage man deserves time off at Christmas – but the city never offers a makeup day for skipped collections, and doesn’t rebate the monthly fee charged for trash pickup when it’s only collected three times a month instead of eight. Nor does the city provide a drop-off point for trash when there’s no collection. Setting out a dumpster in a centralized place during times of emergency might make the difference between garbage being disposed of properly and garbage being thrown out in a ditch or city park. Garbage collection in LaFayette is handled by Public Works, the same department responsible for road maintenance and snow clearing. Keeping the roads in good condition isn’t a profitable operation, and garbage collection (while not free) also loses money for the city year over year. That’s why nobody in leadership cares if the roads are taken care of or the garbage picked up, because both operations cost more than they bring in. For comparison, the electrical department is profitable, generating revenues that go to pad out the city’s operating budget (and keep the golf course open) – which might well explain why the electric department is given higher priority, a real budget, and has a real director. LaFayette’s leaders aren’t going to do anything for free, even if we already paid for it with our tax dollars. If Electric was run like Public Works we’d all sit in the dark six or eight hours a week. Walker County Road Department crews did an admirable job clearing snow and ice from county roads. County trucks were the first ones out after the snow fell, and one Underground Facebook reader reported seeing a road crew go by at 1:11 AM the next day. County crews were effective in plowing the roads mainly because Walker County didn’t invest in dedicated snow-removal vehicles, instead choosing to buy detachable plow blades and sand/salt spreaders that easily mount on a standard pickup truck. That saves money in the long run and allows the county’s existing fleet of trucks to do double-duty during winter weather events. Our only real complaint about county roads is with the way crews handled snow at intersections. Instead of pushing snow and ice to the corner, plow trucks pushed it to the side of whatever road was being plowed, leaving a deep pile of snow at the end of every connecting thoroughfare. More than one vehicle got stuck that that kind of intersection, unable to move ahead because of deep, compacted, snow turning into ice right where cars and trucks stop at stop signs. This problem would be easily avoided if crews would double back and clear intersections properly, but considering how infrequently we have to deal with snow Walker County Road Department employees might not have gotten enough training to know that step was necessary. The truck pictured above, which we’ve dubbed “Plowzilla,” is a Vietnam-war-era military surplus M39 6×6 with an add-on plow blade and salt spreader. It’s also LaFayette’s only plow truck, and the city’s only means of digging out from a heavy snow. Plowzilla has the makings of a good snow mover, but not even a six-wheel-drive army truck can be in two places at the same time. That’s one reason why it took the city several days to clear snow from side streets in less populated neighborhoods: the only clearing was done by Plowzilla and a few random backhoes. Investing in removable blades and spreaders like the county has for city pickups and garbage haulers would speed up snow removal in future incidents without adding overhead costs for additional insurance or vehicle maintenance. 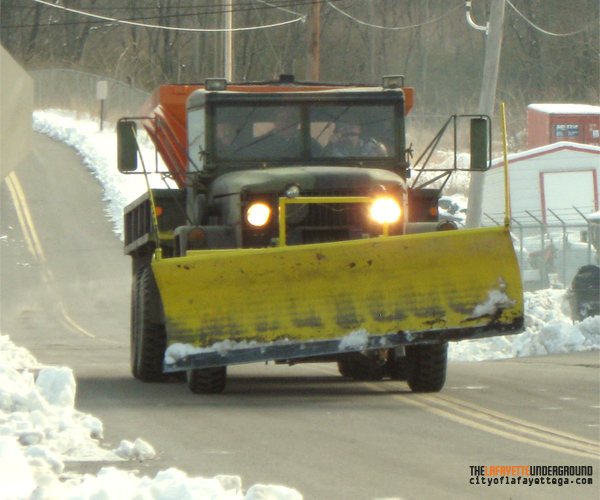 Snow removal would also be sped up if Plowzilla wasn’t sent to patrol the same cleared streets multiple times while ignoring lesser avenues still covered in snow. Connecting streets such as Chattanooga, Duke, Cherokee, Probasco, Patton, and Villanow were cleared quickly and continually scraped over and over during the first few days after snowfall. (Main Street was a state responsibility, which we’ll address in a bit.) But shorter connecting streets were ignored until at least Wednesday the 12th when city crews finally got around to clearing them. Some side streets weren’t plowed and treated until the Friday after snowfall, at which point it made little difference if they were cleared or not. All that driving around in circles resulted in city employees earning $8,665 in overtime pay during the week after snow fell. According to the newspaper the city also spent $26,602 for equipment, $6,170 on “damages,” and $3,600 for de-icing materials. That adds up to a total snow removal bill of $45,037, which is absolutely ridiculous. Comparatively, the higher-altitude city of Lookout Mountain spent only $15,366; Rossville’s snow removal costs were $13,459; and Chickamauga’s bill came out to only $2,226. That’s a combined $31,051 for three municipalities, or 69% of what LaFayette spent to clear snow in a single town. The City of Chattanooga spent six times as much, a reported $249,000, clearing snow during the same period – but Chattanooga had 61 employees working the storm and has a population 25 times greater than the population of LaFayette. $8,665 is a lot of overtime for a single week, especially in a city running one snowplow and a handful of backhoes. But it’s not hard to rack up overtime when a single plow truck requires three men to operate, as evidenced in the photo above. No doubt other city operations during snow week were padded out as much as the plow truck, with multiple men sent to do simple jobs and city pickup trucks following state and county plow trucks for no apparent reason. Walker County pushed the envelope on snow clearing too, but none of the county plow trucks we saw contained more than two employees at a time. $3,600 for de-icing materials (sand and salt) is well within reason, and possibly a bit too low considering how many miles of pavement the city has to keep clear. But $26,602 for “equipment” isn’t reasonable at all. Other municipalities credited most equipment costs to fuel for plow vehicles, but a single diesel truck would run all year long 24/7 for a lot less than that and the city didn’t purchase or rent any snow removal equipment, so where did that money go? Fuel for every city vehicle from mowers to police cars would be one guess, but we’re not sure it would cost that much to top off every tank in LaFayette’s fleet, even including the dozens of employee take-home vehicles. LaFayette city government let the meter run up and padded every possible expense, expecting FEMA to give them all the money back. That’s an abuse of federal largess and adds to the nation’s spiraling deficit, and could backfire on the city if FEMA doesn’t recognize this (relatively minor) snow as a disaster. As part of running up the FEMA tab, the city let snow removal be handled in an inefficient way that basically made it into a bonus week for employees. If not for expectations of FEMA reimbursement they would have cleared all the streets in two days and moved on instead of driving around in circles for a week on the main roads while ignoring side streets, stacking guys up like cordwood inside the trucks, and sending city pickups to follow state plows around the county. This is probably why we didn’t get garbage service the Thursday and Friday after snow – the garbage men were all “involved in snow removal” like the middle guy riding around in Plowzilla. If they’d been out collecting trash there’d be no overtime windfall for them. Christmas in January for city employees. Not that the employees are to blame – every bit of this activity can be traced back to their supervisors at Pubic Works and City Manager Johnnie Arnold. As we noted, the county did a much better job of clearing roads than the city, but some of the county’s expenses were padded too – coming out to nearly $147,000 for the week. Walker County has a huge number of road miles to clear and managed to get most of the roads passable within 36 hours of the snow, but that’s still a lot of dough. The County doesn’t budget anything extra for snow clearing, which is fully the commissioner’s fault, and she’ll probably use this extra expense to justify another property tax increase in the fall – especially if FEMA reimbursement doesn’t materialize. State road crews were few and far between during the snow. Much of the state’s focus was on clearing thoroughfares in unprepared Atlanta, but GDOT did a uniformly inadequate job all across the state. Highway 27 had two cleared lanes on the Monday after snowfall, but wasn’t fully plowed between LaFayette and Rock Spring for several more days. State Highways like 136 and 193 weren’t cleared well either, and residents on Lookout Mountain and in Dade County said they were virtually ignored by state crews. Georgia law limits local agencies from working on state roads even in times of emergency, so Main Street through LaFayette, technically a state road, wasn’t cleared very well until Wednesday the 12th. The state plow truck (which was followed for no reason by a city pickup) shot up sparks as it cleared the middle of Main Street and managed to displace a large number of the street’s freshly-laid reflectors, the replacement of which will certainly turn into another legal battle similar to last spring’s custody battle over a pothole in South Main St.
State Senator Jeff Mullis (R-Civic Center), chair of the Senate Transportation Committee, immediately proposed a resolution he says will make snow removal go more smoothly in the future. One aspect of Senate Resolution 31 “pre-authorizes” local government agencies to clear state roads during an emergency. That would let Walker County and City of LaFayette road crews clear off main roads like Main Street and Highway 136 if state crews couldn’t get to them fast enough. But that adds extra costs to those local agencies and gives the state an excuse not to try at all, so implementing the bill without some safeguards is asking for trouble. Mullis’ bill also calls for GDOT to contract some snow removal out to private companies. That sounds good because it would keep the state from having to invest more money into road clearing equipment not used on a regular basis, but it also lets Mullis funnel money to the out-of-district construction companies that give him tens of thousands of dollars in campaign donations. Private companies don’t have lots of snow plows either, so they would demand a hefty sum to purchase and maintain equipment along with a profit margin – likely making any kind of “snow removal contract” more costly in the long run than having the state buy a few more plow trucks or (ideally) more removable plow blades for existing vehicles. There’s no ideal solution for having snow cleared quickly and efficiently, and giving away road money to Atlanta contractors would only make matters worse. Ending territorial fights over what road belongs to which agency is a good thing, not just for snow clearing but for repairs and maintenance, but measures would have to be put in place to compensate local agencies for doing the state’s job while also keeping them from padding the bill as they’ve done with FEMA. Ultimately there will never be a perfect answer, especially when state and local government officials are corrupt, looking out for their own bottom line instead of working to provide the best possible service to their constituents. No state law can fix that. Mullis also used his snow bill as a platform to demand the state invest in high-speed rail service, his pet project for the last five years. In his argument high-speed passenger trains would be more reliable in a heavy snow than individual cars, but even rails would need to be cleared of snow and aren’t of much use to people trapped in their homes wishing for a way to Bi-Lo for a can of soup. In any emergency situation one of the most important things is to communicate about what’s going on and what’s coming next. On that issue LaFayette’s government failed miserably. During the snow week city offices were closed and the city’s redesigned Web site (which looks worse than the old one – did somebody’s kid major in Web design?) provided absolutely no information about road conditions, weather conditions, or interruptions in city services like garbage collection. The site’s schedule also continued to show January’s city council meeting on the 10th for an entire week after it was postponed to the 17th. TV and radio are good sources for major school and business closings, but in a big storm those resources tend to get overwhelmed with the sheer number of cancellations and can’t provide neighborhood information or very much detail. Web sites, however, can provide that level of information – and in 2011 most people are checking online before they turn on a TV. We aren’t calling for an automated GDOT GA Navigators-style site, but putting up a few notices about road, business, and government closings on the city Web site would serve citizens better than the 1980’s mindset currently being employed. 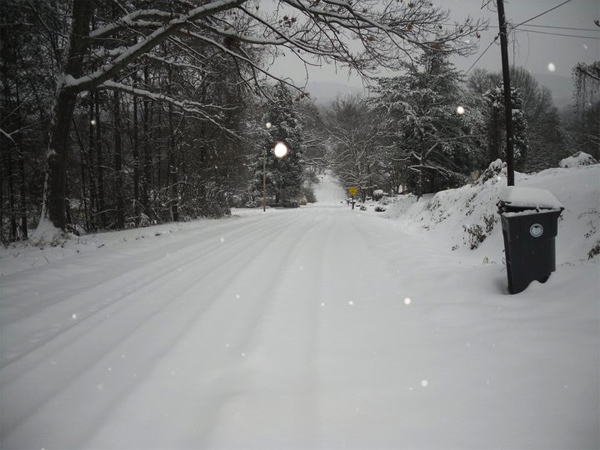 Walker County Schools had no trouble putting closings on its Web site, and even the county’s general government posted a road closure online (a day after it closed). Several years ago LaFayette was supposed to be investing in a text messaging and e-mail push notification system similar to Walker Schools’ SchoolCast, to let downtown businesses know about upcoming events and road closures. So far we’ve only seen that used once, for a parade held several years ago, and even that notification was sent out only a few minutes ahead of the event. Going beyond the Internet, LaFayette could truly serve citizens by reimplementing that system and expanding it to notify all city residents about closures, emergencies, major events, and road conditions. It might cost money, but would reduce the number of accidents or injuries during an emergency situation – unfortunately it’ll never happen unless they think FEMA might pay for it. How was your 2011 snow experience? Join the conversation in comments below. This is true! 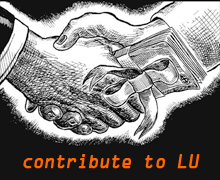 I signed up for it (Shoutcast?) and have gotten almost squat, save for one parade notice. Great Article. I wish I could write as good as you. You were a little more forgiving on the State than I would have been. One my way in that morning i was bragging how great I-59 looked. They had one lane cleared Northbound at 6:00 am and I saw them heading south. I was actually impressed but apparently that is all they did over here in Dade and then departed to destinations unknown. Our Public Works department in Dade deserves a A+. My rural road was plowed and salted by Monday afternoon. And was re-plowed and salted each day there after. When the state did show up to do state roads other than the interstates the equipment broke down. with the increase on power bills this month, did the city turn every ones meter on full speed to pay for all of the overtime during the last few snows? Some of the utility bill increase is because we used more electricity during the week of snow when it was so cold and everybody was at home instead of working or in school. Some of it is because they read the meters late and added a week to several of the bills. And some is because they make crap up. They announced the makeup schedule for teachers today. To make up for snow days, Walker Schools teachers will be working two Saturdays and two additional days at the end of the school year. This will not impact student schedules – but it’s looking like we may have snow this Thursday or Friday so they’ll have to go figure all this out again in a week. See: http://www.catwalkchatt.com/view/full_story/11297677/article-Walker-County-teachers-must-stay-after-school–due-to-snow-days? A week or so after the snow we observed a city street sweeper blocking traffic up South Main spraying water on the road and sweeping up the gravel and sand that had just been spread. There were predictions for more snow later that week so removing an ice preventative made no sense at all (plus the guy obviously didn’t know how to work the machine). But now it makes perfect sense – there’s another few hours of overtime, more equipment costs, maintenance, fuel, maybe tires… Gotta stick it to FEMA to cover our own incompetence. Speaking of power, does anyone have a problem with the power delivered to your residence or business? LaFayette seems to have an large power swing, i.e. voltage. Large voltage swings have a negative affect on light bulbs, electronics, equipment such as refrigerators, etc. A decent systems load dispatcher will keep voltage swings within a couple of volts. The thing about my power bill for January from December consumption was for 50 days, my wife was home everyday, we both was home for a week at Christmas and it was around $350. This past power bill is for 26 days, My wife is back at school and we have one car so we don’t get in until 7pm four days a week, during the snow we only miss three days of work/school and it was at $460. It’s the meter reading and not the cost per consumed. Sure think the meter is running faster than normal.